1. Install the small top bracket to the eave facing first. 2. Install a short 2 or 3 Ft. pipe in the larger bottom bracket and tighten. each end of the bottom bracket with the eave facing. bottom bracket in place keeping your hands free while you install the bottom bracket lag screws. 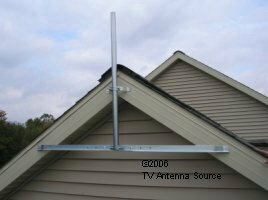 See: Installing a TV antenna eave mount. Mounts to the eave of the roof. Holds mast pipe up to 2.5"
Denny, if I mount on the fascia using an eave mount, is there a safe maximum length I can go with the mast?